Playful pup Pluto is ready for fun with friends. Pluto is Mickey’s loyal and lovable dog. He is vivacious, curious and always eager to make new friends. Pluto loves bounding after a ball or burying a bone in the backyard. But his favorite place of all is snoozing happily at Mickey’s feet. Pluto and Mickey have been together since 1930. 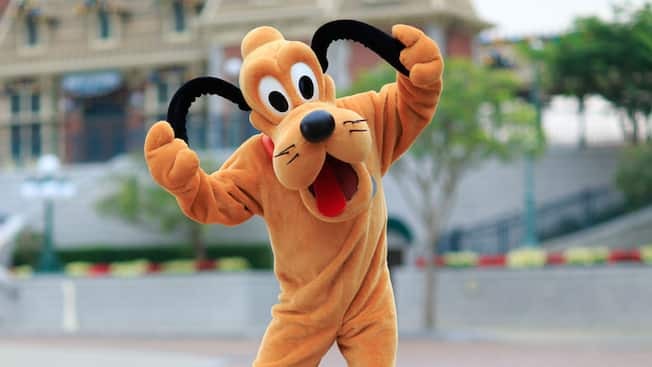 While he happily shares the spotlight with Mickey and the gang, Pluto has been a “leading dog” in his own right. He has starred in all sorts of short films, finding adventures (and misadventures) along the way—even matching wits with a mischievous seal pup and a couple of rascally chipmunks.